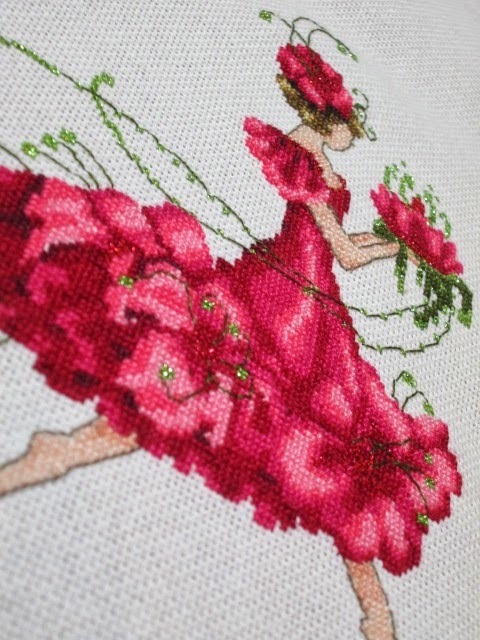 I just finished stitching Nora Corbett's "Geranium" Flower Fairy - (without the wings) I love how she turned out. 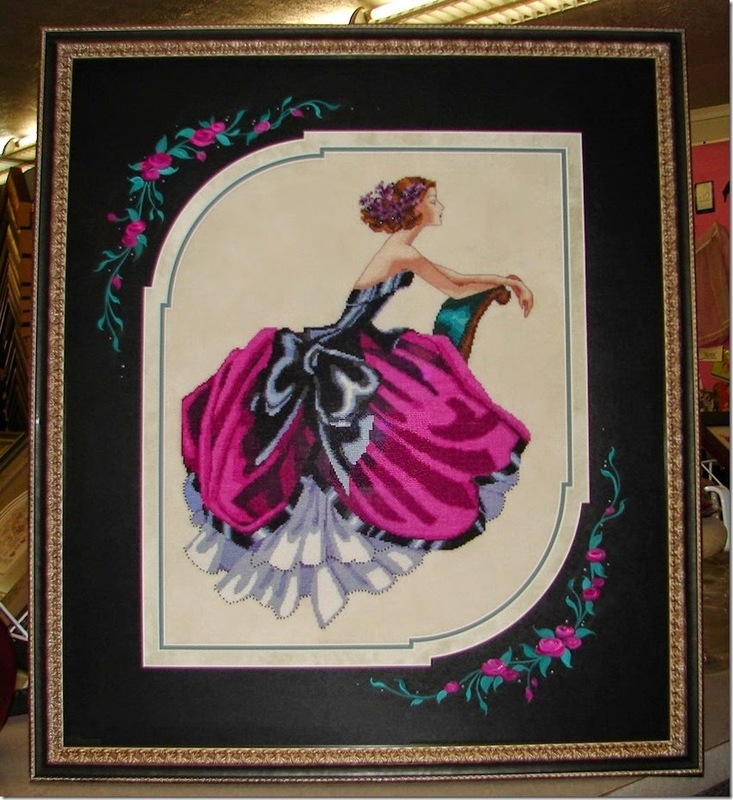 She's stitched over 1 on 25 ct fabric with DMC & I used Kreinik #4 braid instead of the beads. There are a lot more Flower Fairies on my "to do" list - (also without the wings). Hope I can get started on another very soon!! Thanks for stopping by - happy stitching! 2013 & 2014 Stitching Photo's…. 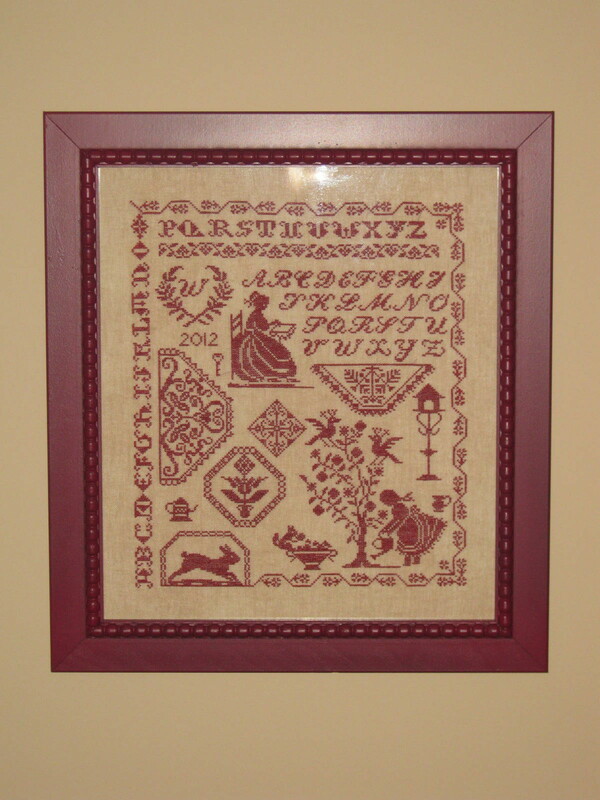 Design is by Silver Creek Samplers, finished in Jan. 2013 for our 25th Anniversary & framed by Jill Rensel. 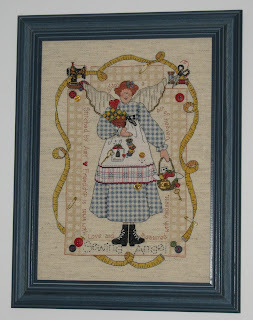 Nora Corbett's Needle Fairy, with lots of color changes. 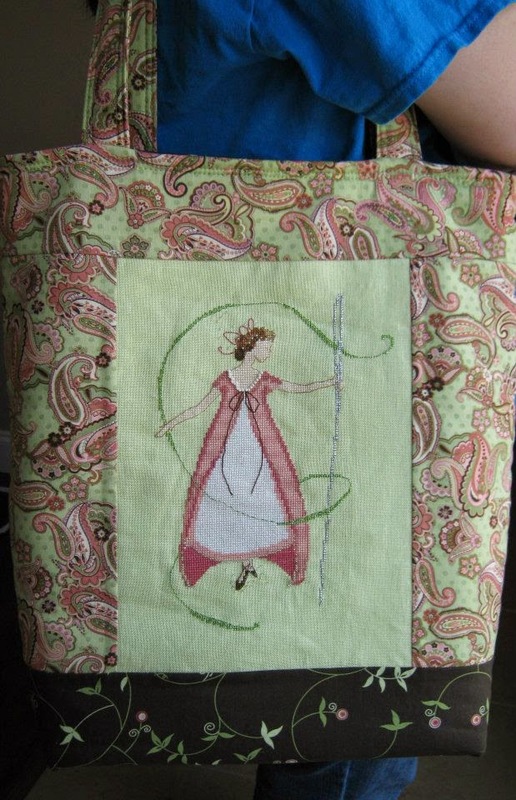 I made it into a tote bag to carry my stitching in. 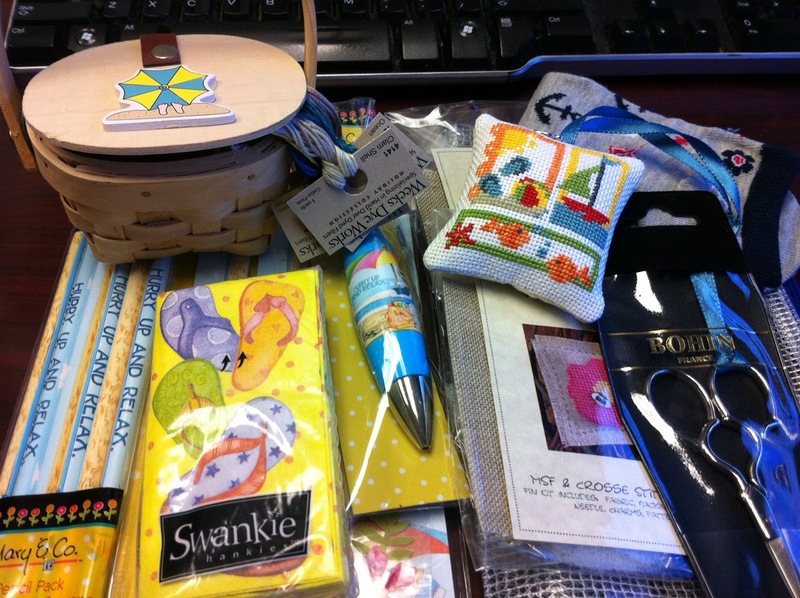 Ornaments for the 2013 Stitching at the Beach Retreat - all were used in the exchange. Nora's "Arezzo" design from her trip to Italy. 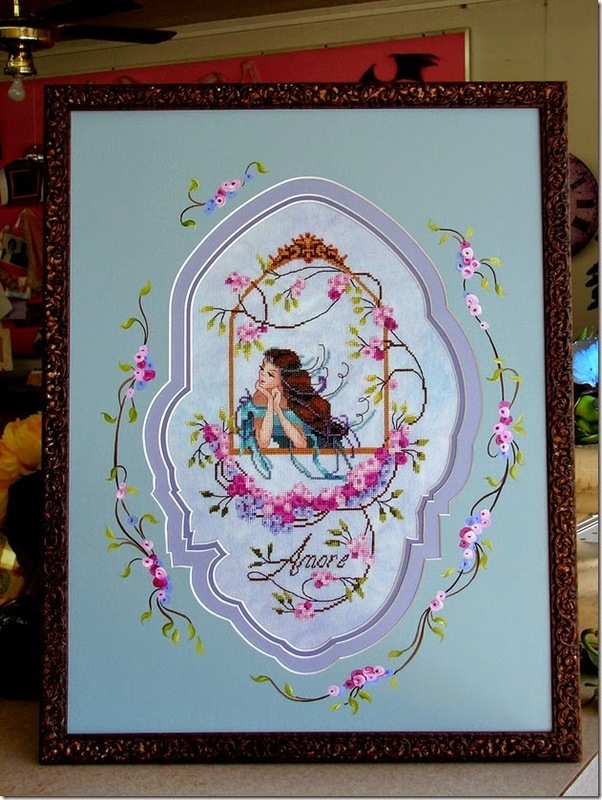 I changed it to say "Amore" and it was framed by Jill Rensel. She's really pretty - much prettier in person! Started in Feb. 2014, finished in April. 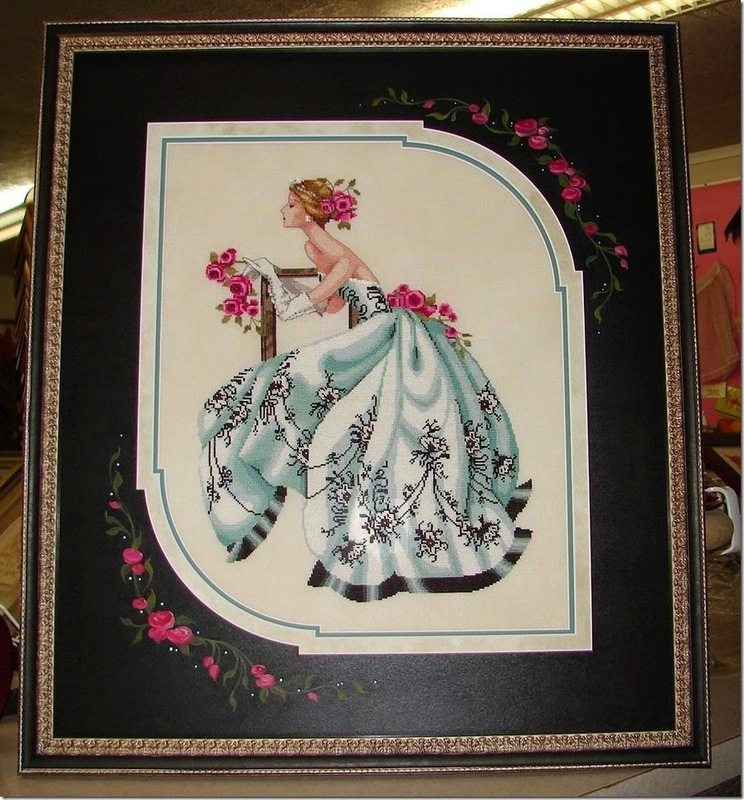 As you can see, I've been stitching a lot of Nora's designs (Mirabilia) - these two are Elizabeth & Sabrina. Elizabeth was stitched in 2013, Sabrina in 2014. 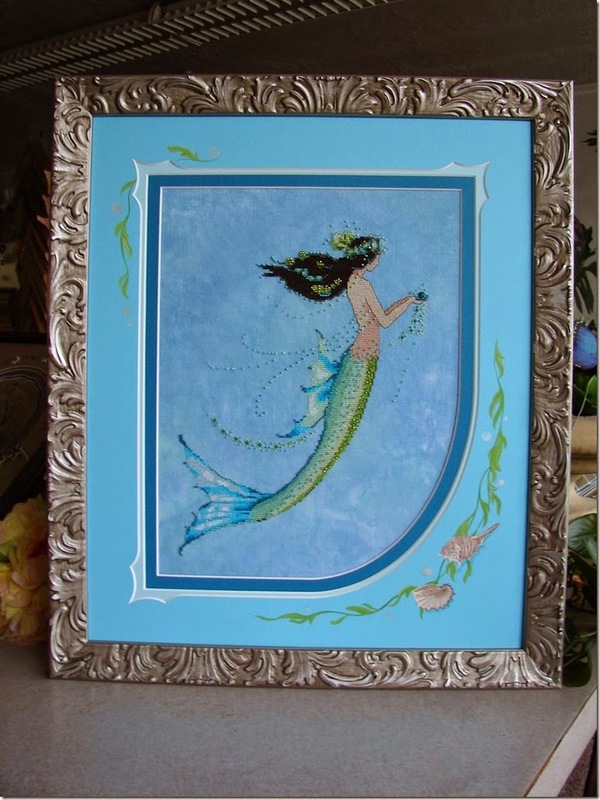 I sent them to Jill Rensel in the summer on 2014, and…..
she did an AMAZING job framing them. There are just no words to tell you how gorgeous these are - if I do say so myself!! And this is Mirabilia's Adia The Garden Fairy - without the wings. Love how she turned out! Jill Rensel still has her - it's been almost 6 months, so I hope to get her back soon. Jill is super busy, but worth the wait… even if it is 6 months. 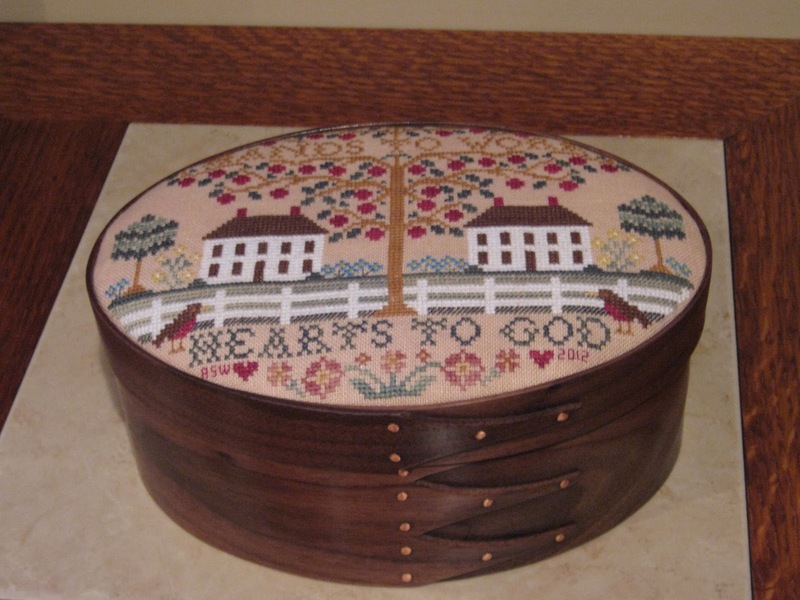 This is a Lizzie Kate Boxer that I stitched for my dear friend Lynn just after we heard the dreaded "C" word. Lynn has cancer and at this point, has been going through treatments for the past 6 months or so. Please keep her in your prayers - we're all hoping for a miracle. Jill framed this really quickly so we could get it to Lynn. There is another Mirabilia "UFO" that I put away to work on a few "holiday" pieces and things for the retreat. 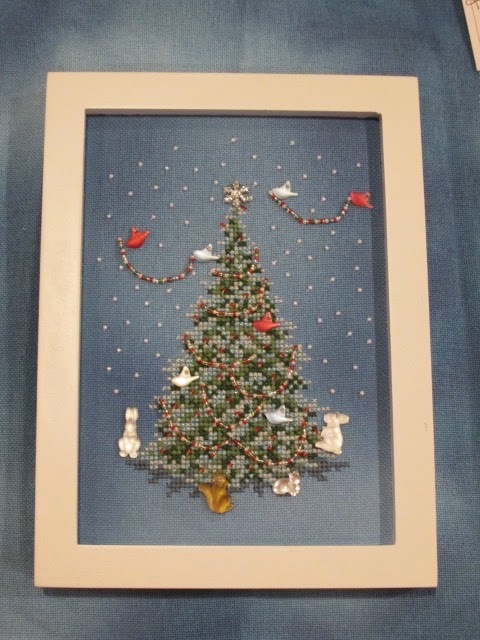 I don't have pics of the retreat things for some reason, but here are a few of the Holiday pieces…. 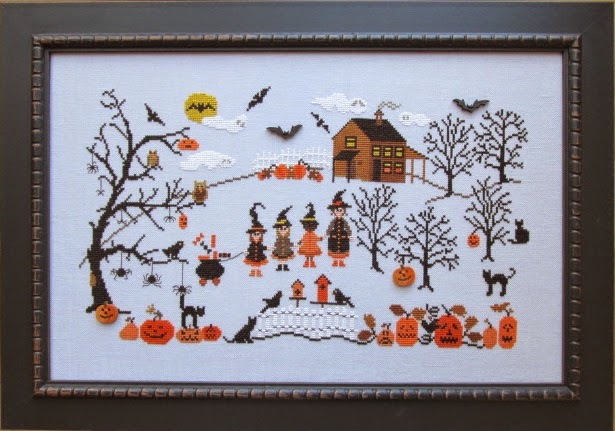 Sara Guermani's "Halloween". Sara is from Italy & does the cutest designs. Most come with hand-painted buttons. This one has 4 buttons, 2 pumpkins & 2 bags. Ray framed it, I think it's adorable! And this is Sara G's. Christmas Window. There are 4 different "Window's" - this is #1. The santa in the center is a button - all the buttons are hand-painted & very cute! And a few small Christmas designs - Mill Hill's "Cookie's for Santa", a Cuore e Batticuore Santa from the Shabby Advent pattern - these all make wonderful ornaments! And last but not least, a design from an older magazine that has more beads than stitches, but it's really pretty in person. All the beads/treasures really make it sparkle. 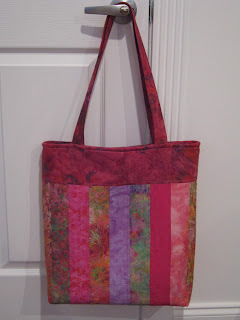 It's stitched on a piece of hand-dyed fabric by Kristy at HLC fabrics - so glad she's back to dyeing fabric. And there are several other things in the works too (other than the Mira UFO). I always used the blog to keep a "diary" for myself of things I've stitched. I got out of the habit though. Maybe in 2015 I can get back into it. Check back once in awhile to see…. I guess things have changed with blogs in the past couple of years because I'm having a very hard time trying to get things to "work", but here is a test post to see what happens! I'm still around, stitching as much as possible, sewing a bit, still collecting too. Ray has been super busy with his projects too. 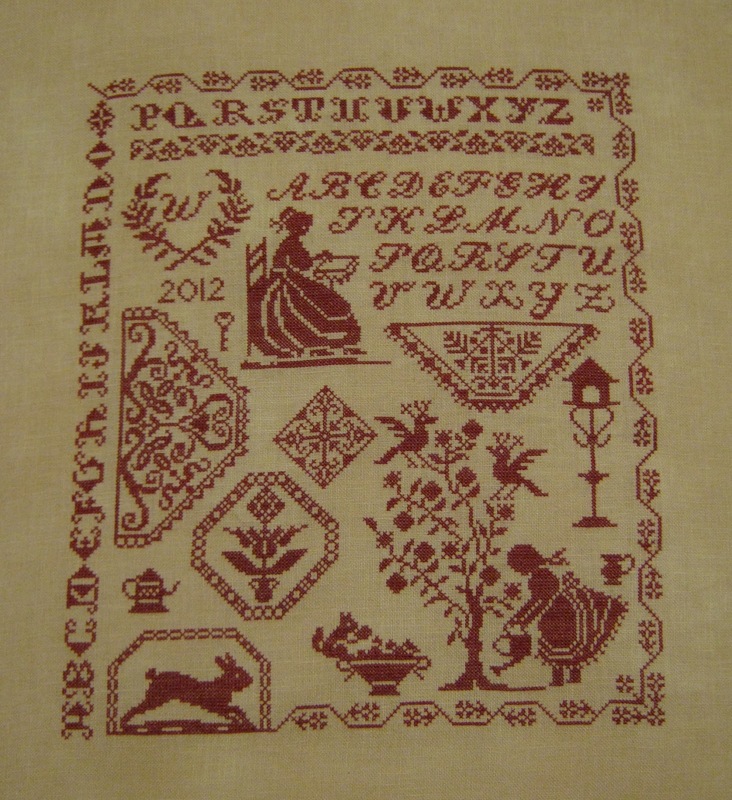 I'll try & make a post with some of the stitching I've done over the past couple of years…. lots of pretty things - imho! Check back soon - just attempting a test post at the moment!! Wish me luck - and check back soon! I did two Summer Fob exchanges and this is one of the fobs, but I don't seem to have a pic of the other. This one went to Kathy K.
It's a Pine Mtn. design & I stitched it over one on 18 ct linen. This is one of the two Halloween pieces I did. I don't have a photo of the other one... maybe I'll ask Myra if she can send me a picture. It was a SB piece mounted in one of the round black boxes. The design is by My Big Toe. And I didn't get a photo of my grab bag. It had a chocolate theme, including a giant chocolate bar on top. My friend Laurie got it. Hope she liked it. I haven't taken pictures of what I brought home, but I will do that soon and post them for you to see. :-) Such talented ladies!!! Nicole had a birthday on Nov. 1st. I made this, using the monogram from the Blackbird Designs Garden Club book (LOVE that book) and the fabric is Moda BBD fabric. I hope she likes it. I just made this the other night - and I love how it turned out. I've had some requests to make some for friends, so I've ordered more of the hardware so I can. The fabric is Moda Blackbird Designs, maybe Garden Party? I can't remember the line, but I love it. 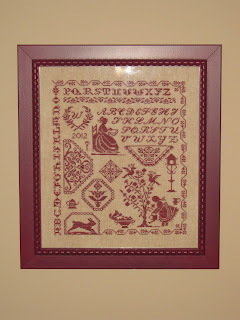 The pattern is called UR Priceless by Madame Samm, and you can find it here. This beautiful cardinal was stitched by my friend Char, over 1 on 28 ct black. I paid her to stitch it for my mom for her birthday because I can't see to stitch on black at all. My mom loved it - it's really beautiful. I finished it into a pinkeep because she likes pinkeeps. Thanks again Char, it's LOVELY! These I just finished last night. Looks like I need to straighten the wire a bit on some of them. They're by Dixie Darlin' and my mom fell in love with the ones that Donna K. stitched for the ornament exchange in MB. I ordered some to stitch and some to give her to stitch for my sister and me. :-) She doesn't know it yet though, I plan to give them to her on Thanksgiving. The first two are for her & the 3rd for my sister. The come in sets of 3 sleds and the patterns each have 3 designs. As you can see, I stitched one of them twice. Please excuse the shadows. The camera batteries died after snapping the photo & I'm too lazy this a.m. to redo. I think you can get the idea from the pic - they're cute!! There are more, but I can't find the photo's. It really wasn't at the top of my list this year to be honest. But I have done a little bit of stitching and a tiny bit of sewing. My mom spends Sunday's at my House (usually) and after lunch today, we have several craft projects we plan to do. Hope you spend your Sunday doing something fun as well! Thanks for stopping by & have a great Thanksgiving week ahead. 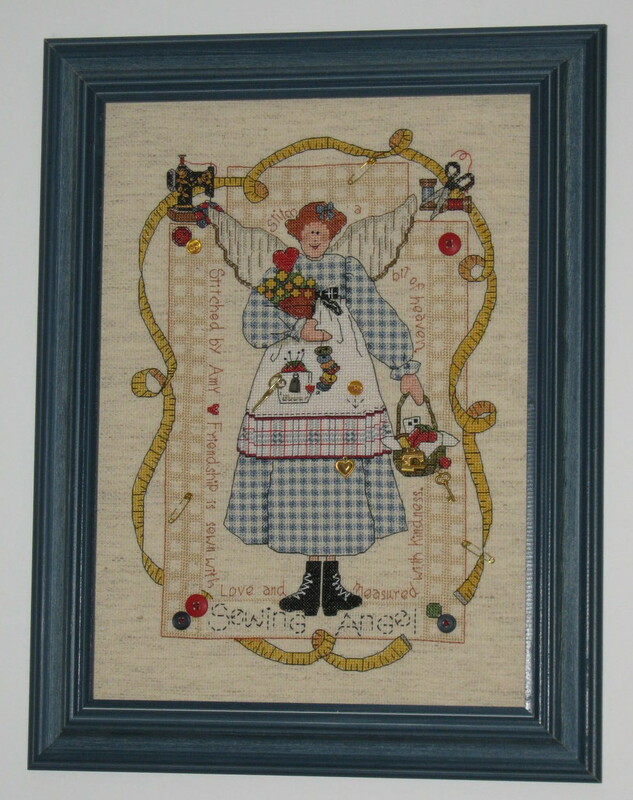 Happy stitching & sewing! Hi - I'm still here. It's been a really rough year for me & I haven't felt like blogging. We lost my dad on July 1st. I still find it hard to believe - almost surreal - and it's still hard to deal with. My mom has been having a very hard time, as I'm sure you can imagine. They were married for more than 48 1/2 years. His loss has left a huge void in all of our lives. At least Ray & I were able to help during the last few weeks, and we didn't leave their house for the last 6 days he was with us. I miss him terribly and can't believe it's been almost 4 months. Anyway, thanks to all those who have kept us in your prayers. He was a wonderful dad and I'll miss him every day for as long as I live. It was really a rough year for several of my friends as well. I have 4 friends who lost a dad and one who lost her mom - all from April 28th-July 11th. Just one after another. :-( Very sad time for all of us. I haven't done a lot of stitching or sewing this summer/fall - some, but not much. I haven't done any blogging or keeping up with blogs. I'm going to try to get back into it (all) soon. Anyway, I just thought I'd stop by & let you know that I'm still around, even though I don't have a lot of fun/positive things to talk about right now. Hope you all have a great weekend & a Happy Halloween next week!! That's it for now. I hope to have more to share in a few weeks. Lots going on right now with life - my dad is very sick and it's taking a toll on all of us. Thanks to those that are keeping my family in your thoughts & prayers, we appreciate it so much. Thanks for stopping by & happy stitching and sewing!! 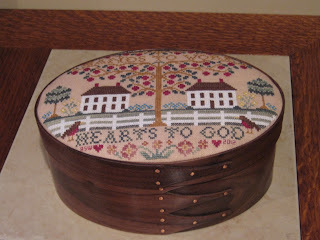 This is Blue Ribbon Designs "Beauty In Simplicity" stitched for the beautiful Oval Shaker Box (which I have!) made by the Canterbury Box Shop. 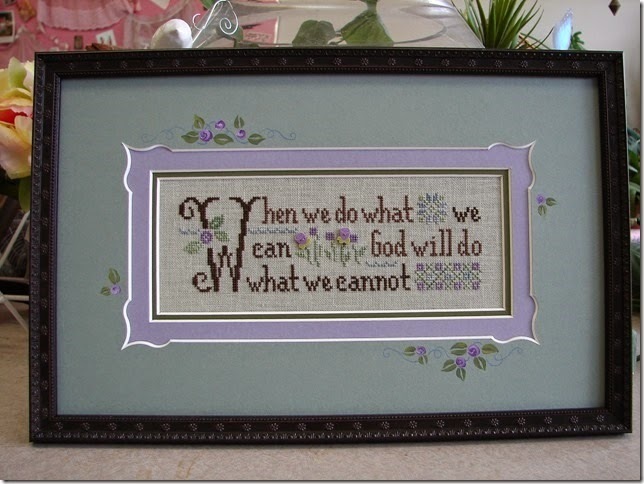 I stitched this one this past week, finishing it up yesterday evening. I can't wait to get it "finished" - I'll post a picture of it again when I do. I love this design and it didn't hurt that it was designed for a shaker box, which I adore as well. The design is also available is a slightly different version to be framed if anyone is interested. AND it comes with smalls that you can stitch & put in the box. I might do those too... they're on my long & ever growing "list". 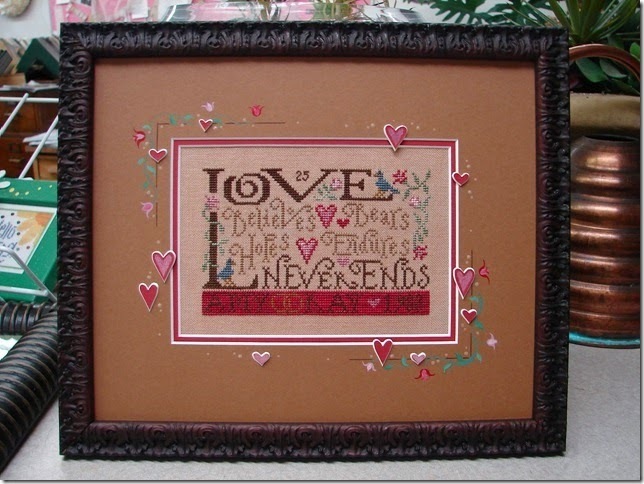 It's stitched on 32 ct Vintage Examplar from Lakeside using WDW floss (I did change one color - the flowers on the bottom are Red Pear instead of Bluecoat Red). I started a new project last night, so stay tuned............ not sure I can get it finished in a week, but I'm going to give it a try. I mentioned in a recent post that there was a lot going on here, but that it isn't good. We found out the 2nd week of March that my dad has cancer. He has cancer in both lungs, around his heart, in his liver and in his bones - all over. My heart is shattered and we're all having a very hard time accepting it. I think both of my parents are more in denial than my sister and I (and our husbands). I can't speak for my brother as we don't speak, but I'm sure he's having a hard time too as he has worked for daddy for the past 10 years & is with him daily. My dad is a wonderful man that's loved by many and always has been. He's the best dad anyone could ever hope to have. I've always been told I was a "daddy's girl" when I was little & I have so many wonderful memories, and I'm thankful for that. I'm also thankful that we have some time to "prepare" and to spend time together. His grandparents and parents lived to be in their mid-80's & mid-90's, so I just always thought he'd live to be "old". He just turned 72 two weeks ago - about the same time we found out about the cancer. My mom knew my dad growing up. He was friends with one of her older brothers. They were married one month after she turned 19 and have been married over 48 years. I don't know how she will manage, but my sister & I will do anything we can for her and our dad. They are doing a liver biopsy on Tuesday as the lung biopsy was "inconclusive". They are fairly certain it's small cell and the oncologist says he would like to try chemo as my dad is "healthy" and active otherwise. Well, other than the cancer has paralyzed his vocal cords, which is how it was found. I want him to be here for as long as he can, but I don't want him to spend whatever time he has left being too sick to do more than lay in a bed. I know there is nothing anyone can say & nothing anyone can do about this, but if you will please keep my dad and our family in your prayers, I would appreciate it. I'm keeping as busy as I can so I don't think about it constantly. I've been working or stitching if I'm not sleeping. I need to get back to sewing too.... that's coming.